SWF is a reliable, affordable roofing business offering quality roof repairs or roof replacements and guttering across Shropshire, Cheshire and North Wales. Our main office is based in Manchester and we have bases in Whitchurch, Chester & Warrington and we take care of any roofing job across the region. We fit new roofs to all types of domestic and commercial properties. Contact us for a free no-obligation quote. There is no callout charge, we give free advice and estimates, do not take deposits, are fully insured and are Environment Agency registered and we recycle all wood and plastic. The sole purpose of rain gutters and drainpipes is to keep the rainwater that comes off your roof from damaging the sides of your house, windows, doors and even your foundations. The amount of runoff generated by the average roof can be surprisingly large. Having correctly installed & maintained gutters and drainpipes will protect your home. We provide expert advice, and supply and install UPVC roofline products that are manufactured from high quality UPVC, to give you complete peace of mind, SO NO MORE REGULAR PAINTING AND MAINTENANCE. We stock a wide variety of guttering and drainpipe systems to suit every need. We can colour match your existing fittings. 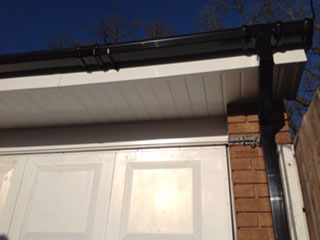 Guttering comes in black, grey, brown or white and can be supplied in round or square formats to match your property. We keep your costs down by supplying and erecting our own scaffolding on sites where scaffolding is required. We will keep the site clean and tidy during our work at your property.